- sWhile still with the Iraqi organization Nature Iraq, the Iraq Upper Tigris Waterkeeper (now with the new conservation organization Waterkeepers Iraq), conducted the Lesser Zab Threat Assessment & Action Plan project that was funded by a Rufford Small Grant in 2012. 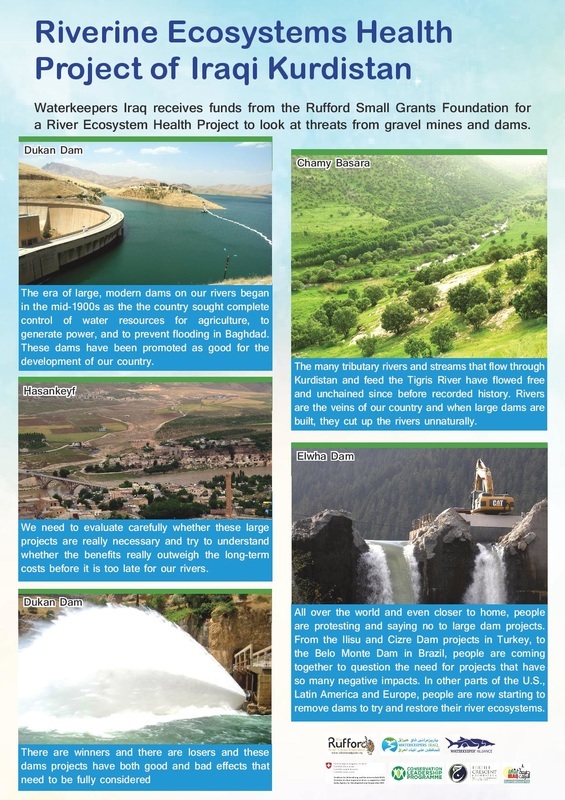 This project involved a comprehensive survey of the Lesser Zab River (a major tributary to the Tigris River in Kurdistan, northern Iraq) to identify all threats along the river and develop a comprehensive Action Plan to address these threats. In 2014, Nature Iraq helped form Waterkeepers Iraq (WI) and this Action Plan has become a guiding document for the work of WI. 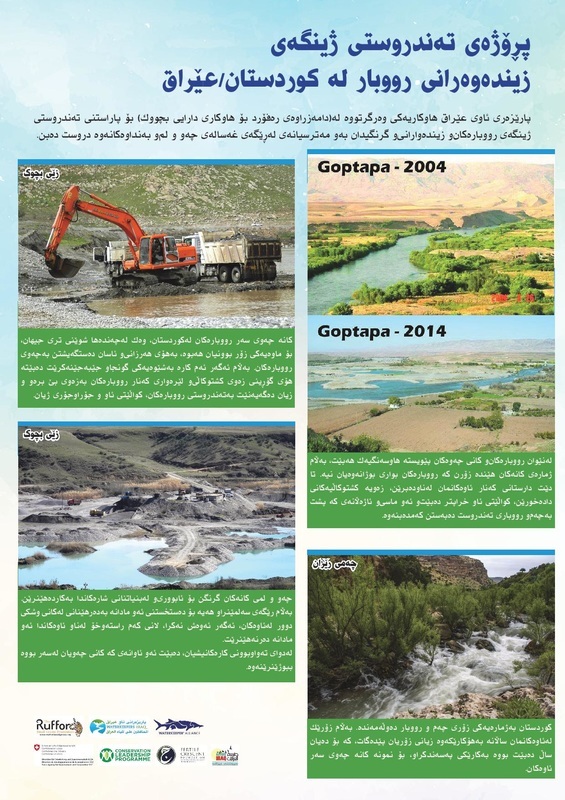 The current initiative will focus on two key objectives under the Lesser Zab Action Plan that was developed under the original Rufford Project addressing two major threats to river ecosystems and biodiversity in Iraq: Gravel Mining & Dams. During the assessment, the Waterkeeper found 15 gravel mine sites (4 posing very high threats and 14 posing high threats to the river ecology), with a confusing cast of characters involved in the mining trade. Permitting is unclear and oversight appears to be extremely poor. 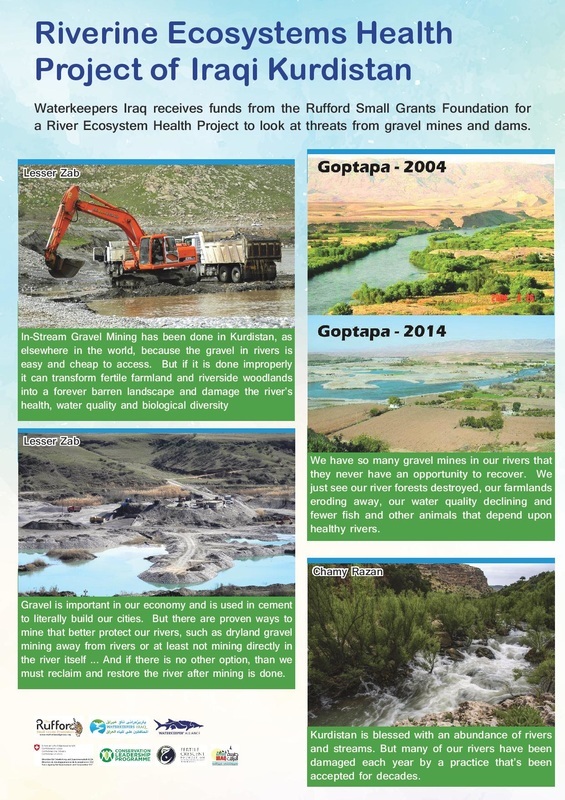 At the 4 existing or proposed dam sites (1 posing a very high threat level and 2 considered as high threats), we found that that dams are sometimes poorly constructed and the public knows little about and has no involvement in the process of dam development. Our project will implement the strategic actions to address these threats and lay the groundwork for a broader outreach strategy. We will develop two in-depth case studies about these threats focusing on two active gravel mine sites and two planned/active dam sites. We will update and build our plans to address each of these threats. We will also create site-specific, awareness-raising and outreach activities targeting local communities and government stakeholders affected by these threats. Collect, develop and publish in-depth information as case studies on gravel mining/dams in the region. Implement an Awareness Program targeting community, government decision-makers & industry to dialogue on these impacts.